Salix provides an award-winning energy survey for maintained schools to reduce their energy usage to the lowest possible level through the installation of energy efficiency technologies. A comprehensive report detailing how your organisation can use different energy efficiency technologies to reduce your energy usage to the lowest possible level. Installing these technologies can help improve the learning environment for both staff and pupils. Advice on how to reduce energy consumption through ‘no-cost’ behavioural changes. Information on all possible technologies that could be installed to reduce energy usage and carbon emissions. Advice on the best order in which to install these technologies and enough detailed information to procure against. A financial model to show how the costs of carrying out the energy efficiency measures can be met with different funding sources, including the Salix interest-free loan. Salix’s SLE flyer explains how the SLE works in more detail. The two main criteria for this fund are that the projects must pay for themselves within 8 years through their predicted annual energy savings; and that the project must not exceed a maximum cost of £200 per tonne of carbon dioxide saved (calculated using our compliance tool). If you have a project that doesn't quite meet the 8-year payback but you have funding available from another source then you can apply for partial SLE funding. For examples of previous SLE projects, please see the knowledge share area of our website. 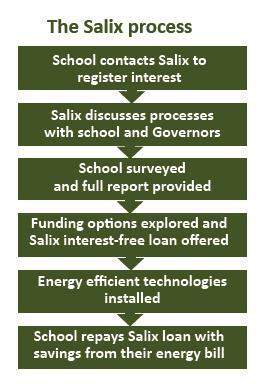 The latest interim report on Phase 1 of the Salix Schools: Switching to Low Energy is available upon request. If you think your school could benefit from this comprehensive energy survey then please call us on 0203 102 69 03 or email: [email protected] for more information. The first step in all SLE applications is the completion of the expression of interest form. Please click here to register your interest.